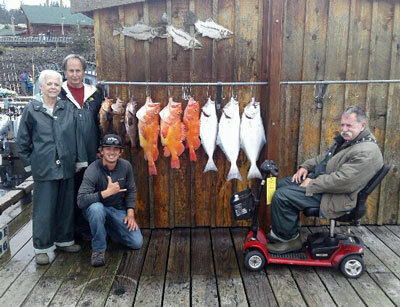 Baranof's commitment to "no fisherman left behind". Some ships moor nearer to our private marina than others. And on days of inclement weather--which are many in this temperate rain forest--we outfit our guests with a great deal of rain gear. If you feel that you or a member of your party will require additional time or assistance in making your way to our marina, or in donning rain gear, please contact us at 907-225-4055 ext. 2 or 1-877-732-9453 or shoreside@baranof.com and we will be happy to make arrangements best suited to your needs. As noted above, if you need additional time getting to our marina or suiting up for the weather, the sooner we know, the greater assistance we can provide. Personal aides or care providers who are tasked with the welfare of a guest may ride along free of charge, unless they too wish to fish, in which event they are required to pay for passage and licensing. For patrons in wheelchairs, or who walk with walkers, canes, or other assistive devices: please note that Ketchikan has very dramatic tidal swings and, while the ramp to our dock is ADA-compliant, at extreme low tides the gangway can be quite steep. Baranof staff are happy to assist in ascending or descending the gangway, but fewer staff are available at our camp site for those on our Alaska Fishing & Wilderness Dining excursion. On that trip, landings at high tide will put you quite close to the site, but landings at low tide can put you as far as seventy yards away, on a gravelly beach with a grade of ten to twelve degrees. We are proud to partner with Southeast Alaska Independent Living, a local advocacy organization for people with disabilities. SAIL has one (1) all-terrain wheelchair which may be borrowed with advance notice on a first-come, first-serve basis. Please contact us if you feel this would be a necessity for your trip. Also, while our ramp is ADA-compliant, the build of the boats and the nature of our dock will require an effort of two or three people to effect a safe and responsible transfer from a wheelchair into the boat, and vice versa. Your safety is our first concern. Please let us know in advance how we may best serve you. Fishing: If mobility is limited in your upper extremities, and you wish to bring electric reels or other assistive fishing devices, you are welcome to do so. We would be grateful for advance notice, so that we may prepare your boat for your gear. We also have a limited number of electric reels available for your use, also on a first-come, first-serve basis. Contacting us ahead of your trip assures us the ability to serve you in the best manner possible. Depending on the level of impairment, it may be advisable to bring an aide or care provider in support of an individual with such disabilities. Such company may ride free of charge, unless they wish to fish, in which case they are required to pay for both passage and licensing. For independent individuals with vision or hearing impairment, every effort will be made to pair this passenger with the right group of people and the right captain, whose attention must necessarily be divided between the needs of all members of the group, plus fishing conditions, weather conditions, water conditions, radio reports, and so on. Every effort will be made to insure a safe and comfortable fishing experience. Please contact us with any questions or concerns. The more we know about your needs, and the sooner, the better prepared we can be to ensure an excellent day on the water. Trips range in length from three to eight hours. All of our captains are certified in First Aid and CPR, and we are fortunate to have a Coast Guard station in town, in the event of unforeseen or unavoidable incidents or circumstances. However, if you have concerns about your health, or the health of a member of your party, we invite you to contact us before the day of your arrival, so that we may address any questions you have. One of the most common questions we encounter is about bathroom facilities. We are happy to report that though this is a frequently stated concern, it is never a problem for our passengers! At each ship berth, there are ADA-compliant bathrooms, which your guide will encourage you to utilize when he or she meets you prior to your trip. There are also ADA-compliant bathrooms at Salmon Landing, which is immediately adjacent to our private marina, and even more ADA-compliant bathrooms in the Fish House, our celebrated eatery at the top of our gangway. We encourage all passengers to utilize these restrooms before suiting up in raingear and getting underway. Our cabin cruisers all have a small, private restroom facility. Our open skiffs do not have this advantage, but can easily be brought to our campsite, or, in the event of an urgent need, may be landed shoreside at the discretion of your captain. Additionally, we have portable (male) urinals available for passengers who may require them. Your safety and comfort are our top concerns. Should you have any questions, or should your require any special accommodations, we are happy to work with you to make your trip as positive an experience as possible.